So far at Tea Time, we’ve covered three different teas flavored with floral, fruit, or herbal notes. Today we’re going back to basics. I’ve been craving green teas recently, and one of the choices in my current supply stash is Tazo®’s China Green Tips Green Tea. According to Tazo®’s website, this tea is made from spring-harvested Mao Feng leaves grown exclusively at 3,000 feet in the mountains of southeast China. That tranquil image, as well as the lure of green tea’s many health benefits, made China Green Tips an easy pick for our next Tea Time review. Steeping Instructions: Use 1 tsp of tea or 1 bag per 8oz of water. Heat water to just under boiling (175 degrees Fahrenheit / 79 degrees Celsius) and steep for 3 minutes. Most green teas are known for their vegetal aroma. Tazo®’s China Green Tips meets this expectation. The first waves of fragrance from the bag remind me of freshly cut grass and running barefoot through the backyard. Raw, clean, and pastoral, but not particularly distinctive. Brewing this tea doesn’t enhance the aroma further, yet the playful, warm gold color persuades you to dive in nonetheless. Taste-wise, China Green Tips proves that what you smell is often what you taste. It glows with a medium body and a pleasant grassiness that’s typical of green tea without being too strong. The smooth, zen-like finish may be what I like most about this tea, though. It’s almost purifying, as if each sip draws out the toxins from your body. If one wanted to taste the lush, mist-shrouded Wuyi Mountains or the calm intoning of a bamboo flute, this cup may be your gateway. That said, China Green Tips is relatively plain. It lacks the complexities or undertones that other unadulterated green teas have. (By “unadulterated,” I mean without any additional ingredients.) My guess is the Mao Feng leaf used here isn’t one of the most savory types to come out of China. Some tea drinkers may not mind this, but I have a hunch that the more seasoned tea enthusiasts would opt for something more sophisticated. Like with Stash’s Vanilla Nut Creme Decaf Black Tea, I experimented with China Green Tips by brewing in the filter bags and in my loose-leaf teamaker (by cutting the filter bags and pouring the leaves into the teamaker). I can’t say I noticed much of a difference either way, probably because the leaves are so finely chopped. The full-leaf satchels might release more flavor – then again, how much more flavor could you milk from a basic green tea? Be careful with how long you brew China Green Tips, by the way. This tea easily becomes bitter and astringent if steeped any longer than the recommended 3 minutes. Stick to Tazo®’s instructions to get the mellow crispness that defines this drink. Personally, I like Tazo®’s China Green Tips. Its simplicity and freshness makes me feel more healthy when I drink it. That alone convinces me to keep investing in this beverage for now. However, without any unique qualities to set it apart from more complex green tea varieties, China Green Tips is far from being a top-notch choice. If you prefer unflavored teas or simply want a cleansing brew, you may want to try this one. But if you’re looking for a cup with character, China Green Tips’ modest infusion might not satisfy you. 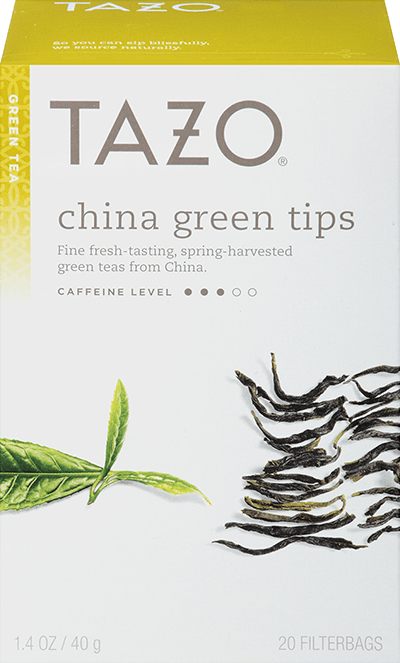 You can purchase China Green Tips Green Tea at select grocery stores that sell Tazo® Tea or at select Starbucks coffee shops.